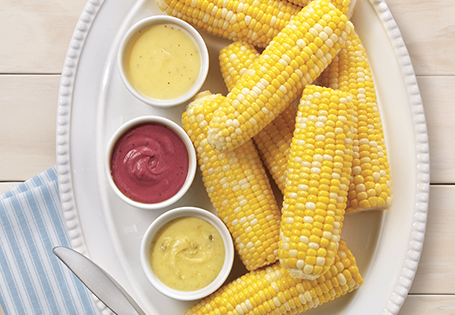 Three compound butters to spice up your corn on the cob. For clarified butter: In medium saucepan over low heat, melt butter. Carefully skim off all white milk solids with a spoon and discard. Boil butter briefly over high heat to help the fat rise to the surface. Over boiling will cause the butter to turn brown. Clarified butter will keep in the refrigerator for up to a month as long as it is tightly covered. Whisk in remaining ingredients and allow to steep for 5 minutes. Coat jalapeño with olive oil and place directly on stove top burner turned on high. Roast until skin is blistered and charred, rotating as needed. Wrap jalapeño in plastic wrap and set aside for 3-5 minutes. Whisk in cumin, salt and pepper into butter and allow to steep for 5-10 minutes. Peel and seed the jalapeño and place it in a food processor with the butter mixture and puree until smooth. In a small saucepan, combine wine, sugar and rosemary sprigs: heat to a simmer. Continue to simmer until only 2 ounces of liquid remains. Add butter, salt and pepper; steep on low heat for 5-10 minutes. Remove rosemary sprigs before serving.